Thought it was time to show why I hadn't blogged much in December. I have been wayyyyyy to busy making Christmas (& 1 birthday) gifts. 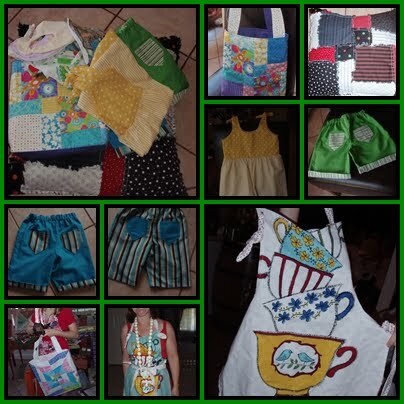 I made a cute little sun dress, 2 pairs of reversible shorts, a shaggy reading pillow, a shoulder bag, a tote, 4 aprons, 2 library bags and a first reader bag, a bag of scrunchies and some bibs. I also made a set of cards for my works secret santa.